April 8, 1947 -- Chicago park district board members approve the revision of a1931 agreement with the Saddle and Cycle Club at Sheridan and Foster, allowing the extension of Lake Shore Drive to the north. In 1931 the club agreed to give up its rights to the Lake Michigan shore. In exchange the park district agreed to build a lagoon for the club. In the 1947 agreement the club gives up the lagoon, which was never constructed. In return, the park district gives the Saddle and Cycle Club 235 feet of land extending toward Foster Avenue and 325 feet on Berwyn Avenue to the north. The club also will be permitted to extend its building liens 185 feet farther east on Foster and 275 feet east on Berwyn. The Saddle and Cycle Club began in 1895 and was literally a "country club". A Jarvis Hunt designed clubhouse was built in 1898, on a five-acre property that sat right on the lake at the southern border of Edgewater. Landfill and the extension of Lake Shore Drive barricaded the club from its lakeshore frontage, but it's still there on Foster Avenue today with about 500 families in its membership. 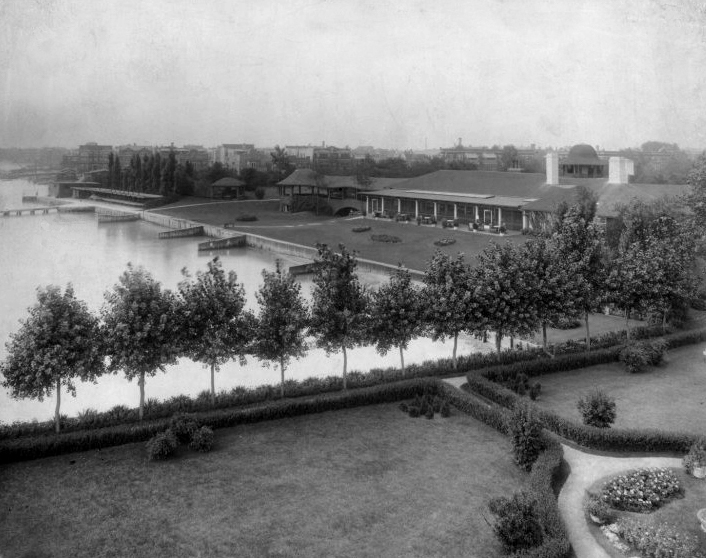 The photo below shows the club in 1915, sitting as pretty as you please right on the edge of the lake.